Hi guys! Hope you’re well and eating good! Today I have a delicious granola recipe for you guys that is one of the best things I’ve ever made. Probably exaggerating a little because I LOVE granola but either way, this recipe is amazing and you’ve got to try it! Granola is awesome for many reasons, you can have it for breakfast, as a snack and most importantly, you can make it into whatever you want! There are no rules when it comes to the ingredients you should put in your granola, it’s all up to you! It’s really just a bunch of oats, nuts and seeds lol! Granola lasts for up to 3 months in the freezer and a few weeks in a cool dry place. 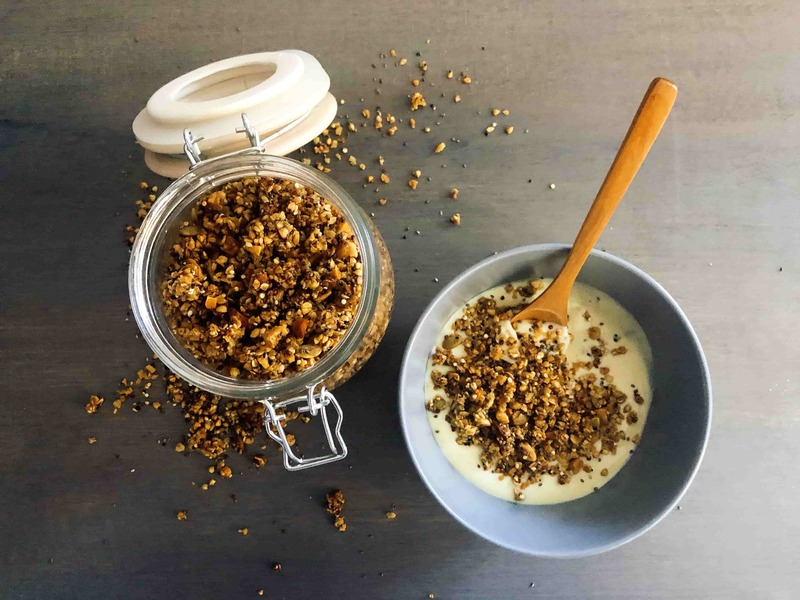 I could go on about the amazing things to do with granola so if you have any questions, please feel free to email me on foodwithdom@outlook.com or DM on my instagram @FoodwithDom. I’ll list the ingredients on how to **COSTOMISE YOUR GRANOLA **and then I’ll list the exact measurements for MY GRANOLA. **Oats: **You can use this if you’d like a more weighty granola, it’s not a must but is the basis for most granola out there! You can find gluten free oats or scrap it all together! Most granolas contain oats but you don’t have to do this! I used buckwheat in mine, which you can use instead to make up more of the volume. For gluten free options, opt out of the oats or find a gluten free oats in your nearest supermarket. I added quinoa too and yes this is all raw but it’s perfectly edible and basically dehydrated in the oven! Apart from nutrional value, quinoa adds awesome crunch and a slight bitterness that I love! **Nuts and Seeds: **Every nut and seed counts here! Sunflower seeds, sesame seeds, chia seeds, linseeds.. if you decide to use hemp seeds, try to crush them first so they’re easier to digest. I like peanuts and cashews but you can use **ANY **nut out there, walnuts, pecans, almonds. Just remember to crush them into smaller pieces so you get some nuts in every bite. If you don’t like nuts, don’t use them! **Oil: **Oil helps the granola get nice and crunchy. I used coconut oil because I like the smell however this isn’t a must. You can go for a neutral oil like vegetable/rapeseed oil. I wouldn’t use sesame or olive oil in this as they can easily overpower the granola. If you’re going for a savoury granola then olive oil works fine! **Sweetener: **I used corn syrup with sugar because this is what I had at home since I use it for some Korean dishes. Go natural if you like by using maple, agave or coconut syrup. Or you could just create your own syrup with a simple sugar and water mixture. Coconut sugar is awesome too. **USE WHAT YOU HAVE. **Remember different sweetners give different flavours too. **Salt and seasonings: **I highly recommend you add salt to this recipe, just a dash because it really brings out the flavour of all the ingredients. I used himalayan but if you’re using table salt, go lightly because it’s much stronger. In terms of spices, it’s totally up to you! Cinnamon and nutmeg work well or go the opposite route and add some heat in the place of cayenne, paprika, curry powder, the list is endless! **Dried fruit, Chocolate, Optional Add ins: **If you’d like to make yours extra special, you can totally add some berries, cacao nibs or chocolate chip, goji berries or chopped apricots. The only rule for this is to add it right at the end when the granola is out the oven and **COMPLETELY COOLED. **Coconut flakes are great but at them half way through baking so they don’t burn! 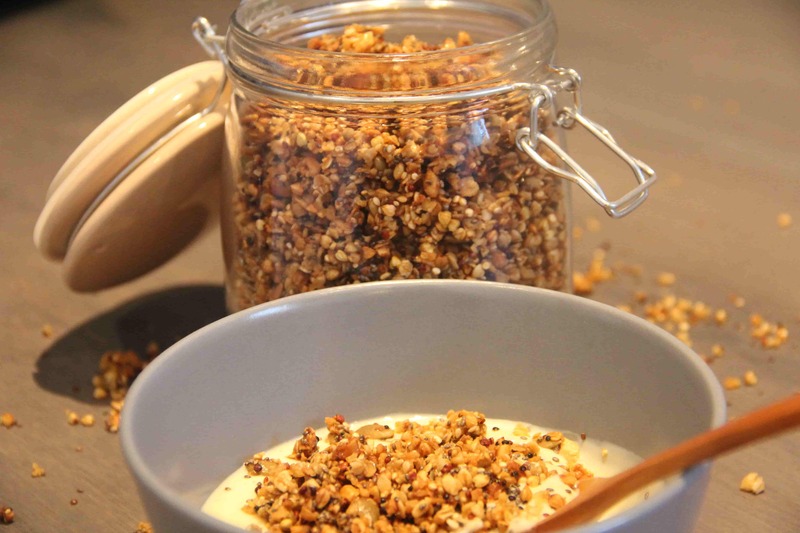 You can even add some orange zest to the dry mix and make a chocolate orange granola! For large clusters, simply turn your granola in the oven once so the pieces stay together. You can wait til the granola is cooled to break them up too. 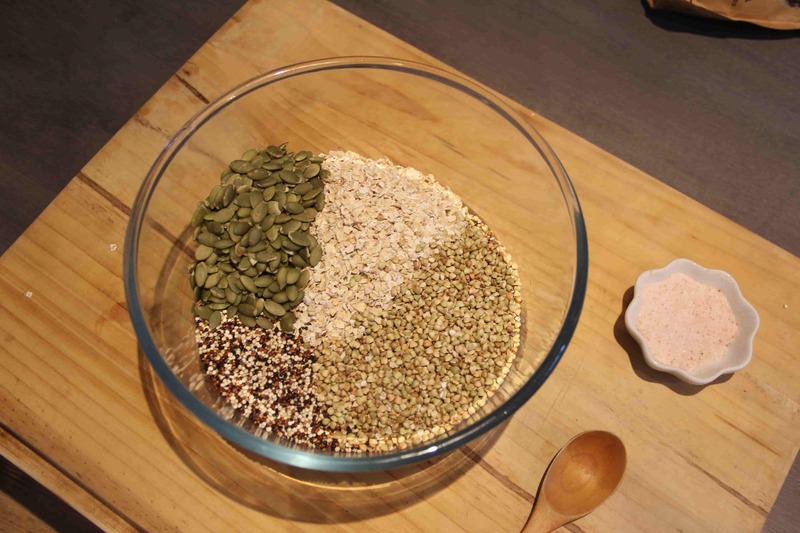 So here are the basics, you can throw your own granola together in no time! The choice is all yours, I’ll list what I did for mine! Add all the wet ingredients to a pan and melt until the sugar is dissolved and coconut oil melted. Add all the wet ingredients to the dry and combine well. Line a baking tray with parchment paper and spread the granola out evenly. Allow to cool completely (at least an hour) and transfer to an airtight container. *The granola dries more as it cools so take it out once it’s golden. Make sure you don’t bake it too long!